Binoculars for solar observing in White-Light. 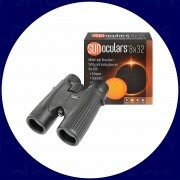 This pocket sized binoculars are only for solar observing. You can view and safely study Sun Spot activity, planetary transits, and eclipses. Lunt SUNoculars have front mounted fully dense white light glass filters making solar observation 100% safe. These front filters are precision polished to ensure the highest level of viewing quality. The light of the sun is reduced to a comfortable 0.00001% transmission and all ultra-violet and infrared components are completely and safely blocked. Lunt SUNoculars are manufactured to the same standards of safety typical to the entire family of Lunt Solar products - the premier manufacturer of Solar telescopes and filters.